Another costly error by Cyrus Jones. #Ravens recover inside #Patriots 5. 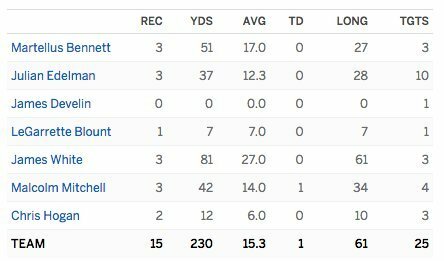 Bennett hadn't had more than 22 yards in a game since Week 10. Patriots take a 23-3 lead with 8:45 left 3Q. Drive: 7 plays, 65 yards in 3:56. 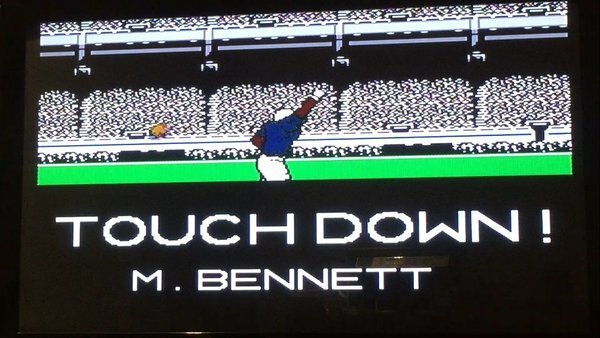 Brady to Bennett, 19-yard TD. #Patriots , 23-3. Blount goes over 1,000 yards for the second time in his career. Blount now has over 1,000 rushing yards (1,005 to be exact) in a season for the second time in his career. Halftime: #Patriots lead 16-3. 16 rushes, 26 passing attempts against #Ravens defense. Solid first half on both sides of the ball for #Patriots against a quality opponent. 16-3, should be more. Looked like Shea McClellin got a little frisky back there again but Tucker's kick went through the uprights. 16-3 Patriots. Tucker's 50-yard field goal cuts #Patriots lead to 16-3. Hochuli will read the rule book to the Gillette faithful at halftime. Cyrus Jones is an adventure, for sure. Ravens line up to go for it on 4th and 2 and false start. Ravens go for it on 4th-and-2, take a TO, STILL get a false start. Duron Harmon is jogging on #Patriots sideline. Harmon is jogging, looks ok.